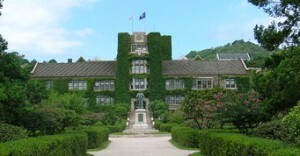 Enter Yonsei Main Gate. Go straight (north) until Underwood Statue Courtyard is directly in front of you. Take road to the left (west). School of Theology is building elevated to the left (west) of the Underwood Courtyard. Enter School of Theology building to the Seminary Chapel. *We provide free parking vouchers after the service. Parking is located in the parking garage below the School of Theology building. Take the stairs or elevator to the 2nd floor to enter the Seminary Chapel. Exit #3- Walk north through Sinchon (away from the Sinchon rotary) to Yonsei University main gate (approximately a 7 minute walk). 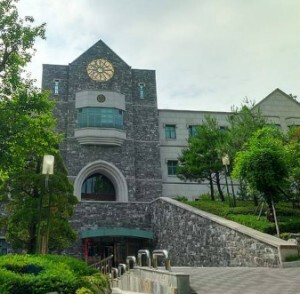 Walk north onto Yonsei University campus to the Underwood statue courtyard (approximately 5 minute walk). School of Theology building sits at a higher elevation to your left (west). It has a circular stained glass window and a steeple roof peak. At Main Gate , North Gate and East Gate of Yonsei University, take a PARKING TICKET and bring it to the church. You will be given a stamp after the service so won’t have to pay for parking. There are currently over 45 busses that stop in front of Yonsei University Campus. The routes of these busses encompass all areas of Seoul and nearby cities, including Incheon, Paju, Ilsan, and Goyang.